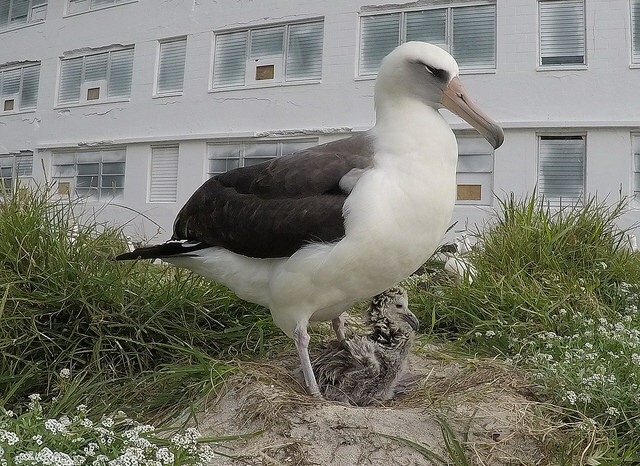 3 months ago Wisdom, the world’s oldest known living wild bird laid an egg, to add to her tally of 36 she has notched up over her nearly 7 decades. 3 months is a lot of sitting on an egg, but Wisdom’s diligence has been rewarded – now the great day has come, and she is proud mum once again to a fluffy little Laysan albatross chick. What perfect timing – Happy Mother’s Day Wisdom! Wisdom was believed to be just five-years-old when she was first banded back in 1956 by biologist Chandler Robbins when Midway Atoll was an active U.S. Naval Air Station. In 2002 Robbins encountered her again by chance and her story took off. Wisdom flies thousands of miles every year to return to Midway Atoll, the breeding site for millions of birds. It is the largest population of albatross on earth: 73 percent of all Laysan albatross, 36 percent of all Black-footed albatross and endangered Short-tailed albatross. The main threats to these birds – on the IUCN Red List of Threatened Species – are entanglement in fishing tackle, and swallowing plastic. It will be another 4 months before Wisdom’s newest baby will fledge. Until then she and her mate Mr Goo have their work cut out avoiding those dangers and providing all the food that a growing chick requires. Please help Wisdom and all life in the oceans by signing and sharing these petitions – thank you! For more updates on Wisdom, check out the USFWS Pacific Region on Tumblr and Flickr. Next postIf You Had The Money, Would You Clone Your Pet? I didn’t know they could live that long, thanks for sharing! Wisdom and her chick are beautiful — a happy event! I wonder if she notices how the world/environment has changed in her lifetime. Though, if she does, I imagine she’s very “zen” about it.